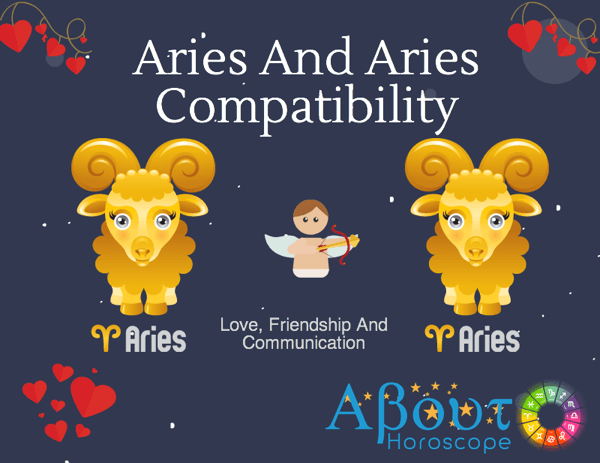 Aries and Aries will make a combination that is sizzling with chemistry! Since, they both share alot in common they will have better understanding of each other. They will have lots of laughter and create awesome memories in their lives. However, the not so good traits they both share too, can also douse the flame. It’s easy to see why these two would be attracted to one another, because they both share the determined spirit of Aries. Aries is cardinal sign, so these two people are always at the forefront of the action. Recognizing a kindred spirit in one another, the physical attraction here will be overwhelming. Aries and Aries compatibility has to last once the honeymoon period is over. Is it possible? Where both partners need to be in charge, as in this match, it’s obvious that there are going to be clashes. Aries’ temper is truly a sight to behold, and when Aries and Aries compatibility is not going so well, there’s no way they can keep it under wraps. Glitches come from traits that are common between them, one of which is impatience. They both can have terrible time together if they both are involved in a spontaneous act. They love to jump at anything new and exciting without giving it much thought or planning. Kinks may ruin what could have been a wonderful adventure together. Another glitch is that they may find themselves in deep sea of debt as they are both spendthrifts. When it does work, this partnership can be one of the most dynamic, exciting and spontaneous of all zodiac pairings. Driving each other on to greater and greater heights, two Aries people who are truly in love can share a passion that many of us never even get to experience. In order to let the best of their shared qualities shine through, however, some compromise is needed. While Aries strives to win and is always the leader of the zodiac, Aries compatibility in this pairing requires that sometimes……just sometimes, the other partner be allowed to win or to lead. An Aries man-Aries woman relationship is like looking into a mirror as each of them sees the other reflected in it. The beginning of this passionate and romantic relationship is usually dramatic, they almost burst into each other’s lives. They will be in awe of their relationship and make flashy gestures to sweep each other off their feet. They are a sight to behold because they make very fetching and charming lovers. They will enjoy traveling together and discovering new places. Camping excursions and leisure trips to the tropics especially appeal to them as both are the adventurous outdoor type. Their trips are likely to happen at the spur of the moment and without much planning. To be able to truly enjoy their trips they should sit down and plan better to avoid disagreements along the way. This will allow them to conserve their energy for serious sight-seeing and exploring. Aries is also the sign of the ram, so expect plenty of horn-banging and head butting when this couple are together. Conflicts occur often, one party must be willing to raise the white flag of surrender on the battlefield of love. A little compromise can go a long way with this feisty match. Though patience and taking it slow may seem difficult, these qualities will help an Aries/Aries combination go the distance rather than fade in the blink of an eye. Another important key to success in an Aries Man– Aries Woman relationship is trust. They should give each other enough space for individuality and growth. He needs his independence as much as she needs hers. Trust is the greatest gift they can give each other and it will strengthen their relationship. The Aries-Aries man woman relationship must learn to overlook glitches and be a little more accommodating and respect the other’s opinions. With an attitude like this, the couple can have a very fulfilling and exciting relationship. One that is full of sparks and a lively energy. Together, they will be able to discover many new adventures and achieve the goals they set together. So what’s the bottom line about Aries and Aries compatibility? This is definitely a relationship worth testing out. They both have the same strengths and weaknesses that aren’t all that bad, so why not give it a shot? The question is whether they will battle one another, or whether they will team up and battle on the same side. If both are fighting alongside one another, instead of with one another, this is an unstoppable relationship. If both of them can compromise and give up the desire to always be in charge and the boss, this relationship may stand a chance. In order to handle the innate competiveness of the relationship, it helps if both partners can have their own hobbies and interests where they can shine, independently. If both partners are interested in the same things, competition will always be evident. For the best kind of Aries and Aries compatibility, both partners should excel in their own ways, in their own fields. This will help to cool the temperature slightly allowing more room for growth. Aries partners like to lead and not to follow. When it comes to arguments, this combination will want to hold their ground, resulting in fiery wars. These sun sign folks need to be a little patient and exercise care when it comes to flare-ups if the relationship is to last. Giving up a bit of the legendary Aries stubbornness is the need of the hour. If they nurture the bond of love and affection they will be able to have a strong relationship that will overcome many obstacles. The silver lining to the Aries-Aries relationship is the fact that Aries are quick to forgive others for their mistakes, these two should have no problem forgiving one another in the case that things go wrong and one of them messes up.